I've never lived in Victoria but I've travelled it extensively and it's a beautiful place. When I was in my teens (quite a lot of years ago now!) I did a big journey all over the state for a couple of months and loved it. I've been back a few times over the years but for shorter visits and mainly to Melbourne. Melbourne has some of the most spectacular parklands in Australia and also some of the best restaurants. It is also very well known for the Markets where you can pick up some great bargains. And definitely worth a visit while you're in the Vic capital is the famous up-market shopping and dining on Chapel Street and Toorak Road in South Yarra. There's no doubt Melbourne is a stunning city but I remember when I first went there we were driving in the city and we wanted to turn right at a set of lights, we had to get in the left lane and wait until the lights went orange and all the traffic stopped then we turned right across the lanes; I don't know if it was all the streets in the city or just that one or even if it's still like that now but it seemed quite weird to me at the time. Our video is packed full of all the information you want on the southern Australian state of Victoria. The capital of Vic is Melbourne. The Australian state of Vic began in the 1830s as a farming community. Attempts at settlement had been made in 1803 and 1826 but these were unsuccessful. Melbourne was founded in 1835. 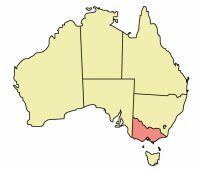 Vic was separated from New South Wales in 1851 and made a British Colony. Gold was discovered near Ballarat and then at Bendigo in 1851. The discovering of gold started a gold rush and the colony of Vic grew rapidly. Vic is the 2nd most populated of the Australian states with about 5,205,200 people living there. More than 70% of these live in the Melbourne metropolitan area. There are 2 other cities with a population of over 100,000. These are Geelong with over 160,000 people and Bendigo with over 100,000 people. Our brother Geoffrey lives in Mildura which is in north-western part of the state in the Sunraysia region. Vic has the second largest economy in Australia, and accounts for around 25% of the nation's gross domestic product. Vic is the dairy farm centre of Australia. 60% of Australia's dairy cattle are in the state. Melbourne is the Capital of Vic and is Australia's 2nd largest city, situated on Port Phillip Bay at the mouth of the Yarra River. Melbourne was the first capital of the Australian Commonwealth from 1901 to 1927. Melbourne is known as Australia's garden city because of its large amount of parks and gardens. Natural attractions of vibrant Victoria include The Twelve Apostles, The Grampians, Wilson's Promontory, the Gippsland Lakes, the former Goldfields region with the historic cities of Ballarat, Bendigo and Castlemaine, The Dandenong Ranges and the Alpine Region. Bells Beach which is the home of the world's longest running surfing competition is also in Vic. It is also home to some world renowned wine regions such as Yarra Valley, Beechworth, Rutherglen and numerous others. The football played in Victoria is Aussie Rules, they are very big on their Aussie Rules Footy and have a great rivalry with South Australia. A person from Vic is called a Victorian. The colloquial term for a Victorian is a gumsucker; it comes from earlier times when the gum tree resin was used as a substitute for chewing gum. Vic was the first to get its own State Flag in 1870. It shows the Union Jack and the Vic State badge. 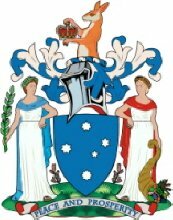 Queen Elizabeth II granted the present Coat of Arms of Vic in 1973. The Vic motto is "Peace and Prosperity". Slogan for Vic: Garden State, The Place to Be or On the Move.